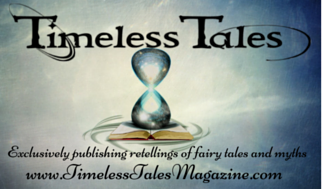 This is Part 2 of a series about reading Tales of 1001 Nights. To start at the beginning of the series, click HERE. I asked an old man walking with his beard down to his knees: “Why are you so bent?” He waved his hands at me. “My youth was lost on the ground,” he said, “And I am bending down to look for it. - Malcolm C. Lyons. The Arabian Nights: Tales of 1,001 Nights: Volume 1. Penguin Books Ltd. Kindle Edition. 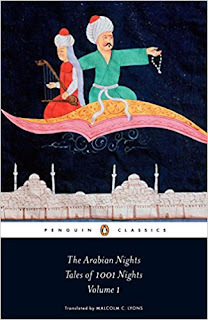 Since the complete unabridged Arabian Nights is around 2,600 pages (the notoriously long War and Peace is only around 1,225 pages), the circle of people who have read the entire thing is relatively small. But there’s always one question that pops ups first when you meet the rare member of this club: What translation are you reading? For a long time, there was only one option if you wanted a complete unabridged translation. There are dozens of partial or abridged compilations, many heavily edited to take out the sexual content and insert Christian morals. 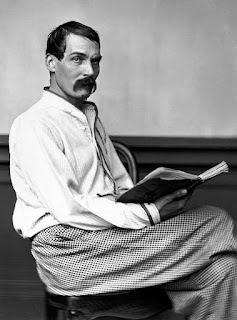 The first to successfully tackle the entire collection was Sir Richard Francis Burton. His 1885 edition stood alone in this category for over a hundred years until Malcolm C. and Ursula Lyons published their Penguin Classic edition in 2008. Considering how long it takes to simply read the full collection, can you imagine being the person who painstakingly converts each page from Arabic to English? The thought blows my mind. Burton’s version is beloved for its grandiose language and extensive footnotes that provide insight into Middle Eastern culture. He deliberately crafted his writing style to evoke epic literature by Medieval and Elizabethan writers like Chaucer and Shakespeare. But perhaps what Burton fans admire most about his work is its authenticity. All those footnotes came about during his many years living in the Middle East, so much of his research stems from firsthand accounts. It’s impossible not to indulge in a small detour about the colorful character of Burton himself. His thirst for adventure led him into plenty of dangerous situations. He infamously disguised himself as a Muslim to make a pilgrimage to Mecca, going so far as to become circumcised to avoid discovery. He was once on an expedition that got attacked by Somali warriors and survived being impaled by a javelin through both cheeks. He immersed himself in every culture he visited and mastered over 26 languages. This larger than life legacy undoubtedly contributes to the continuing popularity of his books. There’s something extra exciting about reading a version of Arabian Nights knowing that the author was a real life Indiana Jones. Okay, joking aside, the Lyons version of Arabian Nights actually has a lot going for it. Think of Burton’s version as the King James Version of the Bible and the Lyons’ translation as NIV. Lots of people love KJV for its beautiful evocative language that is steeped in tradition and history. But others prefer NIV for being straightforward and easier to understand. It’s the same with Arabian Nights. Burton has a tendency towards rambling and flowery language, using “thee”s and “thou”s to evoke an archaic tone. He deliberately chooses obscure words, using Latin whenever the chance arises. My incredibly well read friend Adam enthused about how many new words he learned from Burton’s text. Constantly googling words is fun for some, but cumbersome for others. The Lyons, on the other hand, take a more grounded approach. They aim for clarity and a smooth effortless reading experience. You’ll never lose the train of thought or get exhausted after reading one tale. Some might argue that the Lyons version lacks pizzazz, but others would say that they allow the words to speak for themselves. If you want a more detailed comparison The Guardian wrote this amazing post about the two editions. 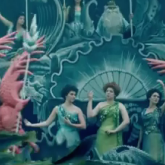 It even has two side-by-side examples of how drastically different they are. If anyone knows how to get in touch with the Lyons, I would love to interview them about the translation process and what their goals were in creating this new edition. Next up in this blog series: Is Arabian Nights Super Sexist? Stay tuned! Okay, so I guess I'll take Lyons. I may be curious about the archaic tone, but I'm not reading this TWICE, so better to have simple. Thanks for explaining this!